Mitsubishi’s ambitious GC-PHEV concept has made its European debut at the Geneva Motor Show. The four-wheel drive SUV features a plug-in hybrid powertrain, with a supercharged 3.0-litre V6 petrol engine mated to an electric motor. 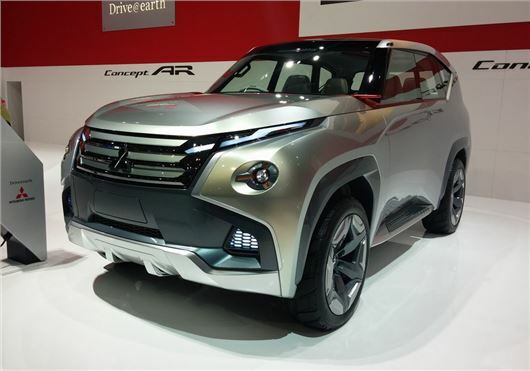 The GC-PHEV is expected to form the base for the next generation Shogun and showcases Mitsubishi’s future design shape, with minimalist headlights and aggressive styling. Indeed, the front of the GC-PHEV is dominated by its imposing grille and skid plate, while its upright appearance is flanked by bulbous wheelarches. The plug-in system combines a 339PS V6 with a 70kW electric motor, with the latter connected to a high-capacity battery that is installed under the boot floor. The petrol engine is mated to an eight-speed automatic ‘box and the hybrid system automatically switches between pure EV Mode and Hybrid Mode(s) depending on driving conditions, remaining battery charge and other factors. The four-wheel drive system includes a rear differential and an electronically-controlled limited slip at the front, which is combined with another electronically-controlled limited slip Differential in the centre and an active yaw control unit at the rear. Inside the GC-PHEV gets touch screen infotainment and a host of safety kit, which includes a driver monitor system that uses an infrared camera to assess the driver’s alertness. The system will also monitor the driver’s eye line and issue warnings if they continuously when they glance away from the road in front. No production date for the GC-PHEV has been confirmed, but Mitsubishi tells us it hopes all of its Geneva concepts will be available by 2020.